Our kitchen remodel has been going pretty slow. Since I last posted about our update here, we’ve been able to put a few appliances in that I’ll be showing you soon and installed this really cool faucet. 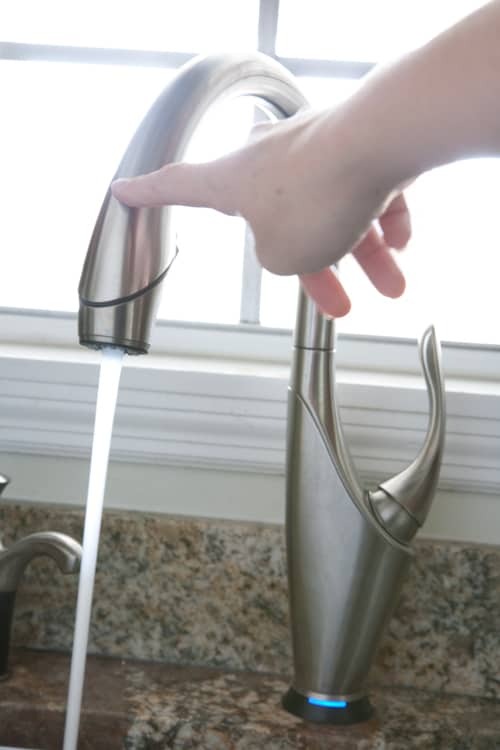 This is one of those new touch faucets that comes on with the touch of your finger. Pretty cool isn’t it? This faucet is the Vuelo made by Brizo. They heard about my kitchen remodel and wanted to send me one of their gorgeous faucets to beautify my sink area. This faucet has SmartTouch Technology. I didn’t think I would get as much use out of this feature as I have. It’s so convenient when your hands are all messy or covered in chicken goo to just tap the faucet with your forearm and have running water. My son also loves it too because he can now reach the facet to turn it on! The facet also is a pull-out sprayer. 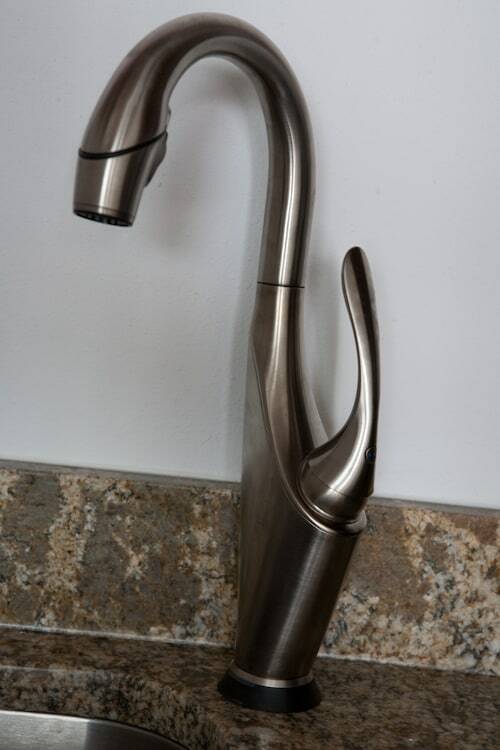 And the best part is, it’s completely hidden in the design of the faucet! The sprayer has MagneDock Technology so when you put the sprayer back, it stays locked in place and looking neat. There’s also a beautiful soap dispenser that get this, you can fill from the top! My husband installed these faucets by himself. 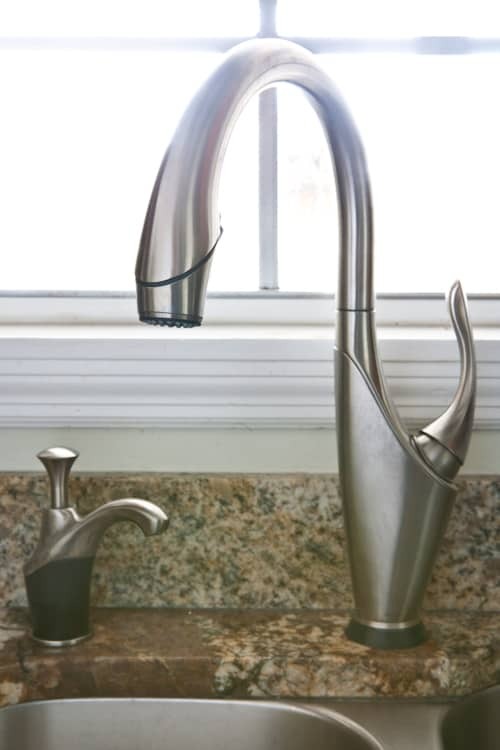 Although the installation is a bit more complicated than a regular faucet, it still can be easily done by a do-it-yourselfer. We also put one of the same faucets (except the bar/prep size) in our bar area, which is part of our home’s bonus room, which is now my office, which will be our next project. Some small things are happening in my office as we work in the kitchen. We’ve installed the granite on the bar, this touch faucet for the sink, and I’ve removed all the wallpaper and am currently sanding down wood trim and cabinets in my spare time. Behind this faucet will be subway glass tile and some glass shelves. Can’t wait to get started on that project after the kitchen is done! The next part of our kitchen will be the new tile floor, which should be started next week. I’ve picked out the new tile, the color of the cabinets and most of the lights. I haven’t yet settled on a paint color, all opinions suggestions very welcome! Disclaimer: I was provided with the 2 faucets and soap dispenser for review purposes. All opinions 100% mine. I love this faucet! The kitchen reno is coming along nicely! Congrats on your kitchen update, Angie. I love my faucet – actually 2. I have 2 sinks in my kitchen. Will be fun to follow along! How cool!! And how awesome to get a kitchen update. Can’t wait to see the finished room! I love it. I’ve always wondered if I would get much use from a touch feature. Having the right kitchen gadgets can make all the difference in the world. Thanks for the updates on your kitchen work – it looks amazing! Great idea. I’d love one of these.